Commercially viable scandium deposits are rare, making widespread use of the metal tricky. Nonetheless, there is indeed opportunity in this market. Scandium is not particularly rare on the Earth’s surface. In fact, it is more abundant than lead, mercury and precious metals. However, the metal also has a low affinity for other minerals. That means it rarely manages to concentrate at higher grades alongside other metals, making commercially usable deposits very rare. What’s more, even when scandium is found at elevated levels, processing it can be difficult, leading to very few stable sources of this critical metal. Not surprisingly, that means there has been very little adoption of scandium in commercial applications. Kaiser made that statement a few years back, and scandium has yet to go ballistic. But he still has hope for the metal, and it could yet have its day in the sun. Below is an overview of the scandium market as it stands today. Topics covered include current production, newcomers to the space and the metal’s potentially bright future. The first reported large-scale scandium production was associated with Russian military programs. Details are lost to history, but Russians reportedly alloyed the metal with aluminum to make lightweight MIG fighter parts. Mining at these historic Russian production sites has ceased. However, stockpiles of scandium oxide and scandium master alloy remain in Russia. These stockpiles are rumored to be dwindling, but continue to be offered for sale on the market. Today, most scandium is produced as a by-product of processing activities associated with the production of other metals, minerals or rare earths. As a result, scandium supply can be affected by the supply and demand dynamics for the metals it is produced alongside of. That can make the metal’s already tough-to-follow market dynamics even more difficult to understand. Principal scandium-producing countries include China, Russia, Ukraine and Kazakhstan. However, a number of junior mining companies in Australia are aiming to develop scandium deposits in New South Wales. According to Kaiser, those include Scandium International Mining (TSX:SCY), Clean TeQ Holdings (ASX:CLQ) and Platina Resources (ASX:PGM). More US production could be on the horizon as well after a push in legislation that encourages the Department of Defense to look into the potential uses of the metal. According to the US Geological Survey, the global scandium market is “small relative to most other metals.” This is best exemplified by global production and consumption of the metal, which is estimated at between just 10 to 15 MT annually. The US Department of Commerce and the International Trade Commission do not have specific data on trading for the metal. Furthermore, there is no formal buy/sell market today — scandium is not traded on an exchange and there are no terminal or futures markets. Instead, the metal is traded between private parties, mostly at undisclosed prices and in undisclosed amounts. Therefore, understanding the precise volume of production and trade is difficult, and independent estimations are more relevant. Production estimates are based on levels of trader activity and interest, as well as the knowledge that some traders deal in the critical metal from very small operations. The estimates also include consumers believed to be sourcing their own scandium through small, controlled recovery operations, but don’t consider amounts of the metal contained in the master alloys currently being sold from Russian stockpiles. Can be used in the creation of stronger, corrosion-resistant, heat-tolerant and weldable aluminum alloys for lightweight aircraft and automobiles. Outstanding electrical properties and heat resistance valuable for solid oxide fuel cells. Unique optical properties for high-intensity lamps. Aluminum alloys present the largest of these potential scandium applications. If only a tiny fraction (0.1 percent) of the annual aluminum market absorbed scandium in alloy at a 0.5-percent level, it would represent 350 tonnes in annual global scandium demand. Many observers believe global demand could reach this level in a relatively short time. In other words, the only barrier to accessing demand from a whole new family of high-performance aluminum materials and energy/lighting products is the lack of a commercially viable scandium deposit. Investors interested in the metal would be wise to do their due diligence on some of the junior companies aiming to make their mark by developing projects containing this critical material. Do you think it’s a good idea to invest in scandium? Let us know your opinion in the comments below. I think it is these supplementary metals that make Texas Rare Earth Resources so appealing. 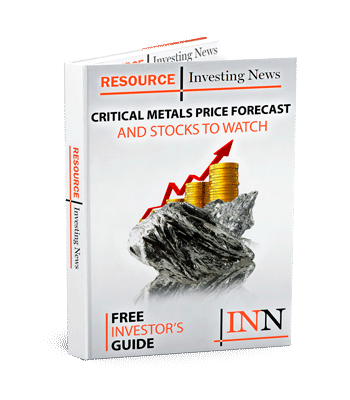 In addition to the primary rare earth deposits, Round Top also contains scandium, beryllium, lithium, and a recent offtake agreement for their uranium, which helps to moderate the price swings in the rare earth market.